The only way to a lush, green lawn is through regular lawn maintenance. Although most gardens have at least a small patch of grass, it is actually one of the most difficult landscape features to grow and maintain. The most important activity to perform regularly in your lawn care is to get out and enjoy it. Walking and playing on a lawn gives you an opportunity to inspect and keep track of problems. 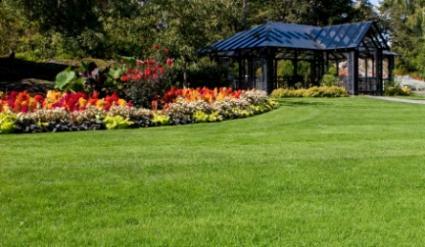 Staying on top of lawn maintenance is far easier than fixing problems once they have taken root. Pay constant attention to your grass, check frequently, and follow these standard basics of lawn care. Lawn Mower - You simply cannot have a lawn and not have a mower. The larger your lawn, the larger the mower you will need. A mower is probably one of the most expensive garden tools you will ever own, so buy the best you can afford and take good care of it. A lawn mower is a true investment; when shopping for a new one - do your homework. The most important maintenance for your lawn mower is keeping the blade sharp. You will also need to winterize the engine when you stop mowing in the fall. Trimmer or Edger - Whether you have the standard blade edger or the universal string trimmer, you will need this power tool to keep your grass in line. Spreader - A small cart or hand-held tool that distributes fertilizer and seeds. Thatcher - Depending on the size of your lawn and thatch problem, a simple thatch rake or heavy power thatchers are available. Leaf Rake - A perfect tool to keep excess leaves and twigs off your lawn, as well as cleaning up grass clippings. If you have a lawn, you must mow. It is the most regular form of lawn maintenance you will do and the most important. Proper mowing techniques will keep your lawn healthy and vibrant, which in turn will keep larger problems and pests away. Avoid the heat of the day while mowing - best in the morning or evening. Mow to the height recommended by your specific grass type. Alternate mowing patterns to prevent grass lean. Never cut more than 1/3 of the length of the grass blade at any one time. Avoid mowing a wet lawn as this spreads disease and clogs lawn mowers. Mow often and leave behind your grass clippings. A small amount of clippings will not hurt your lawn. If you mow less frequently, the heavy clippings will smother the grass beneath, so you will have to remove them. Second to mowing in lawn maintenance is how you water. Lawns tend to be water guzzlers and should never completely dry out. Once you have begun to see the standard color changes associated with low water conditions, your lawn is already in a state of trouble. You can avoid this by watering before your lawn is desperate. Start by creating a regular schedule of lawn watering. This schedule will be different throughout the various seasons and your climate zone. Generally speaking, the average lawn only needs water every two to three days. This will be adjusted based on rain, heat, and wind. Rainy days are days your lawn receives water naturally, but hotter and windier days will mean your lawn might need extra water. The best time to water is just before dawn in the morning. Water your lawn to the depths of your grass' roots. The amount of time and water this will take will depend on your soil type and grass species. For the most effective watering, you should perform a trial test to determine the perfect length of time for your specific lawn conditions. 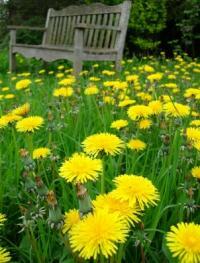 Weeds are simply a part of any lawn and will always be a constant battle. The healthier your grass is, the easier the fight against weeds will be. Following a good lawn maintenance schedule will ensure your lawn's natural defense against most pests and weeds. When you do spy weeds, the best approach is to tackle them immediately. Either spot spray with herbicide or hand pull. To save time, some gardeners use fertilizers with herbicides, although these often do not kill all types of weeds. For more options in natural weed control methods, visit our article on Organic Lawn Care. Fertilizer is a necessary ingredient for a truly healthy lawn. You will need to fertilize your lawn regularly, but the schedule will depend on your individual climate zone. In general, fertilizer is applied during the growth months and not during the dormant periods. Check with a local nursery for advice on your specific area. Don't over-fertilize! Too much fertilizer will damage the grass. It will also be washed away by rains and contribute to water pollution. Always choose a complete fertilizer that includes trace elements. A perfect example is lawn fertilizer with the label, 16-6-8 with iron, zinc and sulfur. Granules are easiest to evenly apply to a lawn. Over fertilizing can kill a lawn. Always follow the instructions on the package - exactly. In any climate, spring and fall are the most important times to fertilize your lawn. The following are lawn maintenance chores most gardeners will need to perform at some time for healthy, green grass. Some lawns never have problems with thatch, while others need to be thatched regularly. You will know it is time to thatch your lawn when the grass feels spongy when walked on. Test it by pulling back the grass blades. If you don't see dirt, you may need to clean up your thatch. Too much thatch has also been linked to insect problems. So, if you are fighting pests in your lawn, you will want to stay on top of the thatch. Most lawns will benefit from the regular effort of aerating. A machine basically pokes holes in your lawn to allow more air flow to the grass and its roots. This is particularly important with heavier clay soils. Always fertilize after aerating to take advantage of the direct path to your grass roots.